"Toronto metropolitan area" redirects here. For the former regional municipality that existed from 1954 to 1998, see Metropolitan Toronto. The Greater Toronto Area (GTA) is the most populous metropolitan area in Canada. It consists of the central city, Toronto, along with 25 surrounding municipalities distributed among four regional municipalities: Durham, Halton, Peel, and York. According to the 2016 census, the Greater Toronto Area has a population of 6,417,516. The regional span of the Greater Toronto Area is sometimes combined with the city of Hamilton, located west of Halton Region, to form the Greater Toronto and Hamilton Area. The Greater Toronto Area anchors a much larger urban agglomeration known as the Golden Horseshoe. The term "Greater Toronto" was first used in writing as early as the 1900s, although at the time, the term only referred to the old City of Toronto and its immediate townships and villages, which became Metropolitan Toronto in 1954 and became the current city of Toronto in 1998. The use of the term involving the four regional municipalities came into formal use in the mid-1980s, after it was used in a widely discussed report on municipal governance restructuring in the region and was later made official as a provincial planning area. However, it did not come into everyday usage until the mid- to late 1990s. In 2006, the term began to be supplanted in the field of spatial planning as provincial policy increasingly began to refer to either the "Greater Toronto and Hamilton Area" (GTHA)[a] or the still-broader "Greater Golden Horseshoe". The latter includes communities like Barrie, Guelph, Kitchener-Waterloo, Cambridge and the Niagara Region. The GTA continues, however, to be in official use elsewhere in the Government of Ontario, such as the Ministry of Finance. A map of Toronto's Census Metropolitan Area, which contains a large portion of the GTA. Markham is the largest city in York Region, and the fourth largest city in the Greater Toronto Area. Some municipalities considered part of the GTA are not within the Toronto Census Metropolitan Area (CMA), whose land area (5,904 km2 in 2006) and population (5,928,040 as of the 2016 census) is thus smaller than the land area and population of the GTA planning area. For example, Oshawa is the centre of its own CMA, yet deemed part of the Greater Toronto Area, while other municipalities, such as New Tecumseth in southern Simcoe County and Mono Township in Dufferin County are included in the Toronto CMA but not in the GTA. These different border configurations result in the GTA's population being higher than the Toronto CMA by nearly one-half million people, often leading to confusion amongst people when trying to sort out Toronto's urban population. Other nearby urban areas, such as Hamilton, Barrie, or St. Catharines-Niagara and Kitchener-Waterloo, are not part of the GTA or the Toronto CMA, but form their own CMAs near the GTA. Ultimately, all the aforementioned places are part of the Greater Golden Horseshoe metropolitan region, an urban agglomeration, which is the fourth most populous in North America. When the Hamilton, Oshawa and Toronto CMAs are agglomerated with Brock and Scugog, they have a population of 6,170,072. It is part of the Great Lakes Megalopolis, containing an estimated 59 million people in 2011. The term "Greater Toronto and Hamilton Area" (GTHA) refers to the GTA, and the City of Hamilton. The term has been adopted by several organizations (including Metrolinx, the Ministry of Energy and Halton Region.) for the purposes of regional planning. The GTHA and the Regional Municipality of Niagara form the inner ring of the larger Greater Golden Horseshoe region. The Greater Toronto Area was home to a number of First Nations groups who lived on the shore of Lake Ontario long before the first Europeans arrived in the region. At various times the Neutral, Seneca, Mohawk and Huron nations were living in the vicinity. The Mississaugas arrived in the late seventeenth or early eighteenth century, driving out the occupying Iroquois. While it is unclear as to who was the first European to reach the Toronto area, there is no question it occurred in the 17th century. By the 17th century, the area was a crucial point for travel, with the Humber and Rouge River providing a shortcut to Lake Simcoe and the upper Great Lakes. These routes were known as the Toronto Passage. The area would later become very crucial for its series of trails and water routes that led from northern and western Canada to the Gulf of Mexico. Known as the "Toronto Passage", it followed the Humber River, as an important overland shortcut between Lake Ontario, Lake Simcoe and the upper Great Lakes. For this reason area became a hot spot for French fur traders. The French would later establish two trading forts, Magasin Royal in the 1720s, although abandoned within the decade and Fort Rouillé in the 1750s, which would later be burnt down and abandoned in 1759 by the French garrison, who were retreating from invading British forces. The first large influx of European settlers to settle the region were the United Empire Loyalists arriving after the American Revolution, when various individuals petitioned the Crown for land in and around the Toronto area. In 1787, the British negotiated the purchase of more than a quarter million acres (1,000 km²) of land in the area of Toronto with the Mississaugas of New Credit. York County, would later be created by Governor John Graves Simcoe in 1792, which would at its largest size, comprise all of what is now Halton Region, Toronto, Peel Region, York Region and parts of Durham Region. The Town of York (present-day Toronto) would later be attacked by American forces in the War of 1812 in what is now known as the Battle of York, in 1813. In 1816, Wentworth County and Halton County were created from York County. York County would later serve as the setting for the beginnings of the Upper Canada Rebellion with William Lyon Mackenzie's armed march from Holland Landing towards York Township on Yonge Street, eventually leading up to the battle at Montgomery's Tavern. In 1851, Ontario County (present-day Durham Region) and Peel County were separated from York. Although the original boundaries of York County encompassed nearly all of the GTA, by 1878, its boundaries had been reduced to the present-day City of Toronto and York Region. The idea towards a streamlined local government to control local infrastructure was made as early as 1907 by member of federal Parliament, and founder of the Toronto Globe, William Findlay Maclean, who called for the expansion of the government of the former City of Toronto in order to create a Greater Toronto. The idea for a single government municipality would not be seriously explored until the late 1940s when planners decided the city needed to incorporate its immediate suburbs. However, due to strong opposition from suburban politicians, a compromise was struck, which resulted in the creation of Metropolitan Toronto. In 1953, the portion of York County south of Steeles Avenue, a concession road and township boundary, was severed from the county and incorporated as the Municipality of Metropolitan Toronto. With the concession of Metro Toronto, the offices of York County were moved from Toronto to Newmarket. Originally, the membership in Metropolitan Toronto included the City of Toronto and five townships: East York, Etobicoke, North York, Scarborough and York; as well as seven villages and towns, which became amalgamated into their surrounding townships in 1967. The early Metro Toronto government debated over the annexation of surrounding townships of Markham, Pickering and Vaughan. The first Metro Toronto Chairman, Frederick Goldwin Gardiner, planned on the conversion of these townships into boroughs of the Metro Toronto government. In 1971, the remaining areas of York County was replaced by the Ontario government with the Regional Municipality of York. In 1974, Ontario and Durham Counties were reorganized to become the Regional Municipality of Durham; Pickering west of Rouge River was transferred to Scarborough at that time. Peel County became Peel Region in 1974 as well. In 1980, North York would be incorporated into a city, with York following suit in 1983 and Etobicoke and Scarborough in 1984, although still part of the Metropolitan Toronto municipal government. In 1992, the Ontario government passed legislation requiring Metropolitan Toronto to include the rest of the Greater Toronto Area into its planning. Despite this however, there was fear different parts of the municipal system were working against one another. Because of this, Bob Rae, then the Premier of Ontario, appointed Anne Golden to head a GTA task force to govern the region's quality of life, competitiveness and governance. During this time, the Metro Toronto government advocated to the task force the creation of a new GTA authority, which would be made up of 21 of the 30 existing municipalities in the GTA at the time. The proposal from Metro Toronto would have resulted in 15 new municipalities. The City of Mississauga argued consolidation should only take place in such a way the new municipalities would have a population between 400,000 and 800,000. The Town of Markham had similarly advocated municipal consolidation in York Region, although it was opposed to complete consolidation into a single municipality. Municipal consolidation faced stiff opposition however from smaller communities such as Ajax, Milton, and the borough of East York. The task force's recommendation to eliminate the Metro Toronto government, and consolidate its remaining municipalities into an enlarged City of Toronto was completed in 1997, under Mike Harris' Common Sense Revolution. However, the task force's recommendation to create a GTA-tier municipality was not taken up by the Harris government, fearing a GTA-wide municipality would recreate the inter-municipal competitiveness that was believed to have impaired the former Metro Toronto government. Metrolinx was established to oversee public transit development across the Greater Toronto Area. Rouge National Urban Park is an urban national park in the GTA. It covers the municipalities of Markham, Pickering, Toronto, and Uxbridge. The Greater Toronto Area covers an area of 7,125 km2 (2,751 sq mi). The region itself is bordered by Lake Ontario to the south, Kawartha Lakes to the east, the Niagara Escarpment to the west, and Lake Simcoe to the north. The region creates a natural ecosystem known as the Greater Toronto Bioregion. The Greater Toronto Area forms part of the neck of the Ontario Peninsula. Vast parts of the region remain farmland and forests, making it one of the distinctive features of the geography of the GTA. Most of the urban areas in the GTA holds large urban forest. For the most part designated as parkland, the ravines are largely undeveloped. Rouge Park is also one of the largest nature parks within the core of a metropolitan area. Much of these areas also constitute the Toronto ravine system and a number of conservation areas in the region which are managed by Toronto and Region Conservation Authority. The Cheltenham Badlands is an example of environmental degradation due to poor agricultural practice. In 2005, the Government of Ontario also passed legislation to prevent urban development and sprawl on environmentally sensitive land in the Greater Toronto Area, known as the Greenbelt, many of these areas including protected sections of the Oak Ridges Moraine, Rouge Park and the Niagara Escarpment. Nevertheless, low-density suburban developments continue to be built, some on or near ecologically sensitive and protected areas. The provincial government has recently attempted to address this issue through the "Places to Grow" legislation passed in 2005, which emphasizes higher-density growth in existing urban centres over the next 25 years. The Greater Toronto Area is classified as a humid continental climate, according to the Köppen climate classification. Much of the Greater Toronto Area is under Köppen Dfb, while Old Toronto (excluding the Toronto Islands) and Burlington are under Köppen Dfa. In winter, which begins in December and ends in March, typical high temperatures will range from −5 to 2 °C (23 to 36 °F) and low temperatures from −11 to −6 °C (12 to 21 °F). Occasional cold spells hold daytime highs below −10 °C (14 °F) for several days, while low temperatures sometimes drop below −18 °C (0 °F). Mild spells are also a feature of Toronto's winter, with temperatures occasionally surpassing 5 °C (41 °F) for several days. Spring is short and often mild, although snow sometimes falls as late as April. Summer is warm, sometimes hot and humid and begins in June and ends in late September. High temperatures typically range from 24 °C (75 °F) to 31 °C (88 °F) while low temperatures hover around 15 °C (59 °F) in the suburbs and 18–20 °C (64–68 °F) downtown and near the lake. Although fairly sunny, summers do feature occasional heavy, thundery showers. Heat wave conditions featuring temperatures between 32 °C (90 °F) and 35 °C (95 °F) are not uncommon. Temperatures are lower near the lake and higher inland. Although rare, the mercury sometimes rises above 38 °C (100 °F). Autumn alternates between wet and dry periods. Temperatures fall sharply in November and by December, cold and snowy weather is common. The summer of 2016 was one of the hottest summers on record with 38 days at or above 30 °C (86 °F). The Greater Toronto Area is a commercial, distribution, financial and economic centre, being the second largest financial centre in North America. The region generates about a fifth of Canada's GDP and is home to 40% of Canada's business headquarters. The economies of the municipalities in Greater Toronto are largely intertwined. The work force is made up of approximately 2.9 million people and more than 100,000 companies The Greater Toronto Area produces nearly 20% of the entire nation's GDP with $323 Billion, and from 1992 to 2002, experienced an average GDP growth rate of 4.0% and a job creation rate of 2.4% (compared to the national average GDP growth rate of 3% and job creation rate of 1.6%). A worker at Oakville Assembly installs a battery on a Ford Flex. In 2010 the automotive industry accounted for roughly 10 percent of Greater Toronto's GDP. In 2010, over 51% of the labour force in the Greater Toronto Area is employed in the service sector, with 19% in the manufacturing, 17% of the labour force employed in wholesale & retail trade, 8% of the labour force involved in transportation, communication & utilities, and 5% of the workforce is involved in construction. Despite the fact the service industry makes up only 51% of Greater Toronto's workforce, over 72% of the region's GDP is generated by service industries. The largest industry in the Greater Toronto Area is the financial services in the province, accounting for an estimated 25% of the region's GDP. Notably, the five largest banks in Canada all have their operational headquarters in Toronto's Financial District. Toronto is also home to the headquarters of the Toronto Stock Exchange and the Standard and Poor TSX Composite Index and offices of the TSX Venture Exchange. The TMX Group, the owners and operators of TSX Exchanges as well as the Montreal Exchange, are also headquartered in Toronto. The TSX and the TSX Venture Exchange represent 3,369 companies, including more than half of the world's publicly traded mining companies. Markham also attracted the highest concentration of high tech companies in Canada, and because of it, has positioned itself as Canada's High-Tech Capital. The Greater Toronto Area is the second largest automotive centre in North America (after Detroit). Currently,[when?] General Motors, Ford and Chrysler run six assembly plants in the area, with Honda and Toyota having assembly plants just outside the GTA. General Motors, Ford, Honda, KIA, Mazda, Suzuki, Nissan, Volkswagen, Toyota, Hyundai, Aston Martin, Jaguar, Land Rover, Subaru, Volvo, BMW, and Mitsubishi have chosen the Greater Toronto Area for their Canadian headquarters. Magna International, the world's most diversified car supplier, also has its headquarters in Aurora. The automobile industry within the region accounts for roughly 10% of the region's GDP. A farm in Caledon. There were 3,707 farms in the Greater Toronto Area according to the 2006 census. While it was once the most dominant industry for residents in the Greater Toronto Area, agriculture now occupies a small percentage of the population, but still a large part of land in the surrounding four regional municipalities. Census data from 2006 has shown there are 3,707 census farms in the GTA, down 4.2% from 2001 and covering 274,363 hectares (677,970 acres). 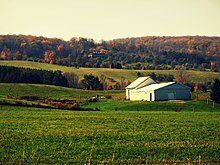 Almost every community in the GTA is currently experiencing a decrease in the acreage of farmland, with Mississauga seeing the most significant. The only communities in the GTA which are experiencing a growth in the acreage of farmland are Aurora, Georgina, Newmarket, Oshawa, Richmond Hill and Scugog, with Markham experiencing neither any growth nor decline. Most of the GTA's farmland is in Durham Region, with 55% of their total land area being farmland. This is followed by York Region with 41% of their lands being farmland, Peel Region with 34%, and Halton Region with 41%. Toronto's remaining farmland is completely within Rouge Park in the Rouge Valley. The average size of the farm in the GTA (183 acres (74 ha)) is much lower than the farms in the rest of Ontario (averaging 233 acres (0.94 km2)). This has been attributed to the shift of farm types in the GTA from the traditional livestock and cash crop farms (requiring an extensive land base), towards more intensive enterprises including greenhouse, floriculture, nursery, vegetable, fruit, sheep and goats. The most numerous farms types in the GTA are miscellaneous specialty farms (including horse and pony, sheep and lamb, and other livestock specialty), followed by cattle, grain and oilseed, dairy and field crop farms. Although the output of dairy production has dropped with farms from within the GTA, dairy has remained the most productive sector in the agricultural industry by annual gross farm receipts. Despite the decreased amount of farmland around the region, farm capital value increased from $5.2 billion in 1996 to $6.1 billion in 2001, making the average farm capital value in the GTA continued to be the highest in the province. There are a number of public transportation operators within the Greater Toronto Area, providing services within their jurisdictions. While these operators are largely independent, provisions are being made to integrate them under Metrolinx, which manages transportation planning including public transport in the Greater Toronto and Hamilton Area. GO Transit, which merged with Metrolinx during the late 2000s, is Ontario's only intra-regional public transit service, linking the communities in the GTA and the city of Hamilton, as well as the rest of the Greater Golden Horseshoe. Implementation of a 'Presto card' by Metrolinx has created a common means for all fare payments and allows for seamless connection between these and other transit operators. Public transit operators in the GTA include Brampton Transit, Burlington Transit, Durham Region Transit, GO Transit, Milton Transit, MiWay (serving Mississauga), Oakville Transit, Toronto Transit Commission (TTC), and York Region Transit. The TTC operates the Toronto subway system, which runs in Toronto and in Vaughan, the latter of which began to be served by the system in December 2017 with an extension of Line 1 to Vaughan Metropolitan Centre station. Highway 401 serves as a major roadway in the Greater Toronto Area. 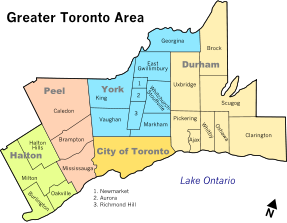 Note: "York", "Peel", "Durham" and "Halton" here refer to the regional municipalities. The Toronto Pearson International Airport in Mississauga is the GTA's primary airport, and ranks among the world's busiest airports. The main airport serving the GTA is Toronto Pearson International Airport in Mississauga, which is Canada's largest and busiest airport. It processed over 47 million passengers in 2017 and nearly 50 million passengers in 2018. Toronto Pearson International Airport is operated by the Greater Toronto Airports Authority (GTAA), and could potentially be asked to help observe in the operations of the other airports in the area, but has yet to be asked to do so. John C. Munro Hamilton International Airport in nearby Hamilton also handles international flights handles some discount flights and charters and acts as an alternate to Pearson. The Billy Bishop Toronto City Airport on the Toronto Islands near downtown is used for civil aviation, air ambulance traffic and regional scheduled airlines (it handled nearly two million passengers in 2012). YTO is a multiple airport code for Pearson, Billy Bishop, and Buttonville Municipal Airport (in Markham). There are also a number of smaller airports scattered throughout the GTA. The Greater Toronto Airport Authority has also placed a tentative proposal to develop a new airport in Pickering (which also extends over into Markham and Uxbridge). As the GTAA predicts Toronto Pearson would be unable to be the sole provider for the bulk of Toronto's commercial air traffic in the next 20 years from the report's publication in 2004 (i.e. in 2024), they believe a new airport in Pickering would address the need for a regional/reliever airport east of Toronto Pearson, as well as complement the airport in Hamilton, Ontario. The GTAA also stated the new airport would create more opportunities for economic development in the eastern region of the Greater Toronto Area. The Greater Toronto Area is served by seven distinct telephone area codes. Before 1993, the GTA used the 416 area code. In a 1993 zone split, Metropolitan Toronto retained the 416 code, while the other municipalities of the Greater Toronto Area were assigned the new area code 905. This division by area code has become part of the local culture to the point where local media refer to something inside Toronto as "the 416" and outside of Toronto as "the 905". For example, the Raptors 905 basketball team in the NBA G League is named after the area code the team represents. Though for the most part, the use of the area 905 as shorthand for the suburban areas outside Toronto city limits was correct, it is not entirely true as some portions of Durham and York Regions use the 705 area code. Furthermore, there are areas, such as Hamilton, the Regional Municipality of Niagara and Port Hope (in Northumberland County) that use the 905 area code, but are not part of the GTA. The unincorporated community of Acton (in Halton Hills), is the only community in the GTA that uses the 519 area code, which covers most of Southwestern Ontario. To meet the increased demand for phone numbers, two overlay area codes were introduced in 2001. Area code 647 (supplementing the 416 area code) was introduced in March 2001 and area code 289 (supplementing the 905 area code) was introduced in July 2001. Some individuals within the 905 area code region may have to dial long distance to reach each other; although residents of Mississauga and Hamilton share the same area code (905), an individual from Toronto, for example, would have to dial "1" to reach Hamilton, but not to reach Mississauga. Ten-digit telephone dialling, including the area code for local calls, is required throughout the GTA. In March 2013, two additional area codes were introduced to the GTA: area code 437 in Toronto and area code 365 in the area served by 905 and 289. Since the 2015 election, the Greater Toronto Area is represented by 47 Members of Parliament in the House of Commons of Canada. Forty-six Members of Provincial Parliament also represent the GTA in the Ontario Legislature. Five Senators from Ontario have also designated themselves as representatives of certain areas in the GTA in the Canadian Senate. Federally, the Conservatives, Liberals, and the New Democrats (NDP) all hold several electoral districts in the GTA. The City of Toronto has often been supportive of the Liberal Party. Traditionally, Liberal support is strongest in Downtown Toronto, while Conservative support is stronger in the surrounding communities outside Toronto. The NDP also has a strong base within the GTA. The Greater Toronto Area has the ability to influence election results and determine the governing party in Canada, due in part to its large population and riding count. From 1993 to 2011, a centre-right party failed to win a single seat in the former Metro Toronto. In the 2011 election, however, a surge in NDP support combined with a collapse in Liberal support allowed the Conservatives to win eight seats in Toronto itself, and another 24 in the suburbs. Toronto's political leanings now appeared to mirror those of surrounding communities that leaned toward the Conservatives. The election of 2011 showed Liberal support, based on votes in the GTA, had collapsed from 43.7% to 30.6%, giving the Liberals only 14.9% of the local seats in the House of Commons. However, the support of the Conservatives and NDP increased accordingly, with the Conservatives increasing their vote share from 31.5% to 42.2% (and capturing 68.1% of the GTA seats) and the NDP increasing from 14.6% to 23.2% of the vote and 17% of the local Federal ridings. In the 2015 federal election, the Liberals regained their dominance of the GTA after suffering devastating losses there four years earlier. They defeated a number of prominent incumbents from both the NDP and the Conservatives. The Liberals took all of Toronto itself. They also took back almost all of the suburban ridings they had lost in 2011. Both the NDP and the Conservatives suffered heavily as their support collapsed in the inner city and the suburbs respectively. Only a few Conservatives held onto their seats in the outer ring of the GTA, while the NDP failed to elect any MPs in this area. On the provincial level of government, the Progressive Conservatives, Liberals, and the New Democrats all hold electoral districts in the GTA. While the GTA provided a strong base of support for the Progressive Conservative government between 1995 and 2003, the Ontario Liberal Party roared to victory in the GTA during the 2003 election and has enjoyed strong support from the region ever since. In the 2011 election, the Liberals won 33 of the 44 available seats in the GTA, allowing Premier Dalton McGuinty to hold onto a minority government. The 2014 election under McGuinty's successor, Kathleen Wynne, was an even bigger electoral landslide for the Liberals, as they won 38 seats in the region. They even took a number of ridings in territory that had voted PC for decades, like Durham, Burlington, Newmarket-Aurora and Halton. The PCs hold no seats in the Peel Region, and only one seat in each of the Halton, York, and Durham regions. While the NDP has been weak in the GTA since the 1995 election, they have seen some successes in Brampton and the Durham Region, where they hold one seat each. The Progressive Conservative Party of Ontario has not won a riding in the city of Toronto during a general election since 1999. On the other end of the spectrum, the NDP saw major losses in Toronto during the 2014 election, and only hold two seats in the city. This is no longer the case since the 2018 provincial election, as the Progressive Conservatives and the NDP made significant gains at the expense of the Liberals. In 2011, 244 politicians govern the Greater Toronto Area below the provincial and federal levels, holding offices in cities, towns, and regional municipalities. Unusual for a large North American urban agglomeration, the GTA has very few agencies with powers that can cross boundaries. Attempts to create an interregional organization have been made, such as the Province of Ontario's Office of the Greater Toronto Area (OGTA) in 1988 and the Greater Toronto Services Board (GTSB) in 1998, but have failed due to a lack of real authority in these agencies. Consequently, there are few interregional public authorities: Metrolinx, an agency of the provincial government, manages the GTA-wide GO Transit system, while the Toronto and Region Conservation Authority manages some of the GTA's watersheds and natural areas. Notably, there is no organization with broad powers as in other Canadian cities, such as the Communauté métropolitaine de Montréal, and Metro Vancouver Regional District. According to the latest census data from 2016 from Statistics Canada, the population of this area is 6,417,516. Population growth studies have projected the City of Toronto's population in 2031 to be 3,000,000 and the Greater Toronto Area's population to be 7,450,000, while the Ontario Ministry of Finance states it could reach 7.7 million by 2025. Statistics Canada identified in 2001 that four major urban regions in Canada exhibited a cluster pattern of concentrated population growth among which included the Greater Golden Horseshoe Census Region, which includes all of the Greater Toronto Area (which includes Oshawa), as well as other Southern Ontario cities including Niagara, Hamilton, Guelph, Kitchener-Cambridge-Waterloo and Barrie. Combined, the Greater Golden Horseshoe has a population of 8,116,000 in 2006, containing approximately 25% of Canada's population. The Toronto CMA also has the largest proportions of foreign-born residents (46%) as a share of the total population out of all metropolitan areas in the Organization for Economic Co-operation and Development (OECD). The Toronto region is also unusually diverse over the composition of its ethnicities. The four largest foreign born populations of Toronto only constitute 15% of the total foreign-born population. This is opposed to the four largest foreign-born populations of other metropolitan areas such as New York and London, where they make up 25% of their respective foreign-born populations. Statistics Canada also found in 2006, there were 31,910 Aboriginal people living in the Greater Toronto Area, which represented 2.7 per cent of all Aboriginal persons in Canada and 13.2 per cent of those in Ontario. The majority of which, however, are not registered with the Indian reserves within the Greater Toronto Area, the Chippewas of Georgina Island First Nation and the Mississaugas of Scugog Island First Nation. Education in the Greater Toronto Area is managed by the provincial Ministry of Education, who manages preschool, elementary and secondary education, while the provincial Ministry of Advanced Education and Skills Development administers laws relating to tertiary education, including post-secondary education and vocational schools. There are presently 12 public English first language school boards, and two French first language school boards operating within the GTA. Seven of these school boards operate secular schools, whereas the other seven operate separate schools. In addition to public schools, there are also a number of private schools that operate within Greater Toronto. Three of these GTA-based school boards also manage institutions outside Greater Toronto, the two French first language school boards, based in Toronto, as well as the Dufferin-Peel Catholic District School Board (DPCDSB). The Conseil scolaire catholique MonAvenir operates French separate schools throughout the Greater Golden Horseshoe, whereas the Conseil scolaire Viamonde operated French secular schools throughout the Ontario Peninsula. The DPCDSB maintains English first language separate schools in Peel Region, and in Dufferin County, a county adjacent to the GTA. Conversely, English first language schools in Clarington, a municipality within Durham Region, are managed by school boards based outside the GTA. In Clarington, Kawartha Pine Ridge District School Board manages public English secular schools, while the Peterborough Victoria Northumberland and Clarington Catholic District School Board manages public English separate schools. The University of Toronto, which was established in 1827, is the largest higher education institution in Canada. Building shown is 1 Spadina Crescent. Three universities based outside of the GTA operate satellite campuses within the GTA, including McMaster University, Trent University, and the University of Guelph. The Ron Joyce Centre, in Burlington, is a 4.5-acre (1.8-hectare) site mainly used by the McMaster's DeGroote School of Business. Trent University also operates a satellite campus in Oshawa, known as Trent in Oshawa. Guelph's Humber Campus is in Etobicoke, Toronto. There are also a number of private career colleges spread throughout the Greater Toronto Area. ^ Adopters include the regional transportation planning body Metrolinx, the Ministry of Energy and Infrastructure and the Regional Municipality of Halton. ^ a b The school board is based outside the GTA, although it also maintains schools in Clarington, a municipality in Durham Region. In addition to Clarington, the school board also maintains institutions in the City of Peterborough, Peterborough County, Northumberland County, parts of Hastings County. ^ In addition to Peel Region, the school board oversees schools in Dufferin County. ^ Halton: "(Code 3524) Census Profile". 2011 census. Statistics Canada. 2012. Retrieved March 1, 2012. ^ Peel: "(Code 3521) Census Profile". 2011 census. Statistics Canada. 2012. Retrieved March 1, 2012. ^ Toronto: "(Code 3520) Census Profile". 2011 census. Statistics Canada. 2012. ^ York: "(Code 3519) Census Profile". 2011 census. Statistics Canada. 2012. Retrieved March 1, 2012. ^ Durham: "(Code 3518) Census Profile". 2011 census. Statistics Canada. 2012. Retrieved March 1, 2012. ^ "Population and Dwelling Count Highlight Tables, 2016 Census". Statistics Canada. ^ a b c "Places to Grow: Growth Plan for the Greater Golden Horseshoe" (PDF). Ministry of Public Infrastructure Renewal. 2006. p. 9. Archived from the original (PDF) on July 6, 2011. ^ a b c "Amendment No. 38 to the Regional Plan (2006)". Regional Municipality of Halton. December 16, 2009. ^ a b "About Us". Metrolinx Website. Metrolinx. ^ "Planning for Growth" (PDF). Understanding the Growth Plan for the Greater Golden Horseshoe. Ministry of Public Infrastructure Renewal. Archived from the original (PDF) on July 6, 2011. ^ "Population and dwelling counts, for census metropolitan areas and census agglomerations, 2006 and 2001 censuses – 100% data". Statistics Canada, 2006 Census of Population. March 13, 2007. Retrieved March 13, 2007. ^ "Statistics Canada - The Daily". Statistics Canada. February 8, 2017. ^ "Greater Toronto Area and Toronto CMA Map". City of Toronto. Retrieved February 7, 2018. ^ "Population of census metropolitan areas (2006 Census boundaries)". Statistics Canada. Archived from the original on February 13, 2010. Retrieved March 2, 2010. ^ "2006 Census: Portrait of the Canadian Population in 2006: Subprovincial population dynamics". Statistics Canada. Retrieved March 2, 2010. ^ "Population and dwelling counts, for census metropolitan areas, 2006 and 2001 censuses – 100% data". Canada 2006 Census. Statistics Canada. Retrieved July 25, 2008. The constituent CMAs are Toronto (5,113,149), Hamilton (692,911), Oshawa (330,594), Brock(11,979) and Scugog(21,439) for a total agglomerated population of 6,170,072. ^ "First Peoples, 9000 BCE to 1600 CE". Toronto Culture – Exploring Toronto's past. City of Toronto. ^ a b c d "Natives and Newcomers, 1600–1793". Toronto Culture – Exploring Toronto's past. City of Toronto. 2009. ^ "The Toronto Carrying-place". Nature Conservancy of Canada. Archived from the original on June 19, 2010. Retrieved February 28, 2010. ^ Rayburn, Alan (September 18, 2007). "The real story of how Toronto got its name". Mapping Services. Natural Resources Canada. Archived from the original on December 9, 2011. ^ Ontario's Districts – 1798 Archived February 12, 2011, at the Wayback Machine, Queen's Printer for Ontario. Retrieved on February 6, 2010. ^ "A Provincial Centre, 1793–1851". Toronto Culture – Exploring Toronto's past. City of Toronto. 2009. ^ a b Archives of Ontario (February 28, 2010). "18th and 19th century Ontario Counties and Corresponding Districts". Queen's Printer for Ontario. Archived from the original on February 13, 2010. ^ Robert M. Stamp (1991). "The Road to Rebellion". Tories and Reformers. Town of Richmond Hill Public Library. ^ Archives of Ontario (February 28, 2010). "Ontario's Districts – 1851". The Evolution of the District and County System 1788–1899. Queen's Printer for Ontario. Archived from the original on June 11, 2011. ^ Municipality of Metropolitan Toronto Act, Queen's Printer for Ontario. Retrieved on February 6, 2010. ^ a b c Archives of Ontario (February 28, 2010). "Municipality of Metropolitan Toronto and the Regional Municipality of York". Queen's Printer for Ontario. Archived from the original on June 19, 2009. ^ City of Toronto Act, 1997 Archived October 17, 2015, at the Wayback Machine, Queen's Printer for Ontario. Retrieved on February 6, 2010. ^ Population and land area figures for Toronto and the regional municipalities come from the 2006 Canadian census: . ^ About Us Archived October 15, 2010, at the Wayback Machine, Rouge National Urban Park. Retrieved on February 7, 2010. ^ Jurisdiction and Participating Municipalities, Toronto and Region Conservation Authority. Retrieved on February 7, 2010. ^ "Bowmanville Mostert". Canadian Climate Normals 1981-2010 Station Data. Environment Canada. Retrieved May 12, 2016. ^ "Oshawa WPCP". Canadian Climate Normals 1981–2010. Environment Canada. Retrieved April 12, 2014. ^ "Burlington TS". Canadian Climate Normals 1981–2010. Environment Canada. Retrieved April 9, 2014. ^ "Georgetown WWTP". Canadian Climate Normals 1981–2010. Environment Canada. Retrieved February 17, 2015. ^ "Oakville Southeast WCPC". Canadian Climate Normals 1981–2010. Environment Canada. Retrieved October 12, 2013. ^ "Albion Field Centre". 1981-2010 Canadian Climate Normals. Environment Canada. Retrieved May 12, 2016. ^ "Toronto Buttonville Airport". Canadian Climate Normals 1981−2010. Environment Canada. Retrieved April 12, 2014. ^ "Richmond Hill, Ontario". 1981–2010 Canadian Climate Normals. Environment Canada. Retrieved February 16, 2015. ^ "Stouffville WPCP". Canadian Climate Normals 1971–2000. Environment Canada. Retrieved May 12, 2016. ^ "Woodbridge, Ontario". Canadian Climate Normals 1981–2010. Environment Canada. Retrieved December 17, 2013. ^ "Toronto's key industry clusters: Financial services". City of Toronto. Retrieved February 28, 2010. ^ Lu, Vanessa (March 16, 2010). "Should Toronto go it alone?". Toronto Star. Retrieved March 24, 2010. ^ Top 10 Reasons for Investing in the GTA Archived March 5, 2010, at the Wayback Machine, Greater Toronto Marketing Alliance. Retrieved on February 7, 2010. ^ Labour Force Archived April 19, 2010, at the Wayback Machine, Greater Toronto Marketing Alliance. Retrieved on February 7, 2010. ^ a b c Financial Services Archived February 14, 2011, at the Wayback Machine, Greater Toronto Marketing Services. Retrieved on February 7, 2010. ^ Markham's High-Tech Companies in The Branham Top 300 Canadian IT Companies Archived June 10, 2011, at the Wayback Machine, Town of Markham. Retrieved on February 7, 2010. ^ Automotive & Advanced Manufacturing Archived February 17, 2011, at the Wayback Machine, Greater Toronto Marketing Alliance. Retrieved on February 7, 2010. ^ About Magna Archived November 14, 2008, at the Wayback Machine, Magna International. Retrieved on February 7, 2010. ^ Contact Us Archived November 14, 2008, at the Wayback Machine, Magna International. Retrieved on February 7, 2010. ^ a b GTA Agricultural Profile Archived March 26, 2010, at the Wayback Machine, Greater Toronto Area Agricultural Action Committee. Retrieved on February 12, 2010. ^ The Big Move Archived April 7, 2010, at the Wayback Machine, Metrolinx. Retrieved on February 7, 2010. ^ What Is GO? Archived April 3, 2018, at the Wayback Machine, GO Transit. Retrieved on March 2, 2010. ^ About PRESTO, Queen's Printer for Ontario. Retrieved on February 7, 2010. ^ Public Transportation Archived March 5, 2010, at the Wayback Machine, Greater Toronto Marketing Alliance. Retrieved on March 2, 2010. ^ "Ontario government investing $401 million to upgrade Highway 401". Ministry of Transportation. August 6, 2002. Archived from the original on September 14, 2007. Retrieved March 18, 2007. Highway 401 is the world's busiest highway in the world and a vital link in Ontario's transportation infrastructure that carries more than 400,000 vehicles per day through Toronto. ^ Highway 401, Cameron Bevers. Retrieved on February 22, 2010. ^ "Southern Ontario Road Maps Map 3" (PDF). Ministry of Transportation. Retrieved March 2, 2010. ^ GTAA – Toronto Pearson today, Greater Toronto Airports Authority. Retrieved on March 4, 2010. ^ Passenger Statistics 2008[permanent dead link], Greater Toronto Airports Authority. Retrieved on March 4, 2010. ^ "Tenant List". PortsToronto. Archived from the original on November 27, 2010. Retrieved February 26, 2010. ^ "Toronto Island airport set new passenger record last year". ^ Byers, Jim (September 6, 2007). "Pickering airport idea revived". Toronto Star. Retrieved February 26, 2010. ^ "Area Why are some 905 numbers long distance while others aren't? And what's with this 647 business?". Toronto Life. Retrieved February 28, 2010. ^ "Toronto Cultural Tips". National Geographic Society. Retrieved February 28, 2010. ^ a b "Area Code Map for Toronto". WhitePages Inc. Retrieved February 28, 2010. ^ "CO Code Status". Canadian Numbering Administration Consortium. Archived from the original on May 11, 2010. Retrieved April 7, 2010. ^ "CO Code Status". Canadian Numbering Administration Consortium. Archived from the original on April 2, 2010. Retrieved April 7, 2010. ^ Toronto to get extra area code, CBC News. Retrieved on February 7, 2010. ^ a b "Order CRTC 2001-840". Canadian Radio-television and Telecommunications Commission. Archived from the original on February 3, 2004. Retrieved February 28, 2010. ^ Telecommunications Alliance | New area codes for the Greater Toronto Area. Newswire.ca. Retrieved on July 26, 2013. ^ "Senators in Alphabetical Order". Senate of Canada. Retrieved February 26, 2010. ^ "Tories struggle in Toronto's Liberal strongholds". CTV News. Archived from the original on October 21, 2010. Retrieved February 26, 2010. ^ Jones, Jennifer Ditchburn and Allison (October 12, 2015). "Election 2015: Why the Greater Toronto Area boils down to a few distinct fights". ctvnews.ca. ^ Toronto Star |https://www.thestar.com/news/federal-election/2015/10/19/red-wave-rolls-over-the-gta.html. thestar.com. Retrieved on November 3, 2015. ^ "Ontario Votes 2007 – Regional results". Canada: CBC. Retrieved March 24, 2010. ^ "Liberals surge in Toronto, 905 ridings". Canada: CBC. October 11, 2007. Retrieved March 24, 2010. ^ "GTA Liberal ridings shut out vote-hungry Tories". Canada: CBC. October 7, 2011. Retrieved October 7, 2011. ^ Lorinc, John. "How Toronto Lost Its Groove, and why the rest of Canada should resist the temptation to cheer", The Walrus, Toronto, November 2011. Retrieved on November 20, 2011. ^ Lu, Vanessa (July 15, 2009). "GTA needs economic 'war cabinet'". The Toronto Star. Retrieved February 26, 2010. ^ a b e/?search=browseRepealed&context= Greater Toronto Services Board Act, 1998, Queen's Printer for Ontario. Retrieved on February 22, 2010. ^ Rao, Nirmala. Cities in transition: growth, change and governance in six metropolitan areas. p. 65. ^ "Metrolinx – About Us". Metrolinx. Retrieved February 26, 2010. ^ "About: TRCA". Toronto and Region Conservation Authority. Retrieved November 20, 2011. ^ "Toward 2025: Assessing Ontario's Long-Term Outlook" (PDF). Ministry of Finance (Ontario). Archived from the original (PDF) on March 27, 2009. Retrieved February 28, 2010. ^ "Toward 2025: Assessing Ontario's Long-Term Outlook". Ministry of Finance (Ontario). 2005. Retrieved May 23, 2007. ^ , Statistics Canada. Retrieved on February 22, 2010. ^ , City of Toronto. Retrieved on February 22, 2010. ^ Ministry of Education, Ontario (2010). "About the Ministry". Government of Ontario. Queen's Printer for Ontario, 2010. ^ Ministry of Training, Colleges; Universities, Ontario (2010). "Welcome to TCU". Government of Ontario. Queen's Printer for Ontario, 2010. ^ Office of Public Relations, McMaster University (June 17, 2009). "Celebrating expansion into Burlington". McMaster Daily News. McMaster University. Archived from the original on July 6, 2011. Retrieved May 6, 2011. ^ Trent University (2010). "The Trent Difference in Oshawa". Trent University. Trent University. Archived from the original on December 25, 2010. ^ University of Guelph and Humber Institute of Technology and Advanced Learning (2005). "bout the University of Guelph-Humber". University of Guelph-Humber. Archived from the original on July 24, 2010. Retrieved December 10, 2018. This page was last edited on 21 April 2019, at 21:58 (UTC).